Every Certified Pre-owned Volkswagen purchase from Volkswagen Canada entitles you to the following incentives. Plus, upgrading from the VW Assurance Program to the Volkswagen Assurance Premium Program will entitle you to receive subsidized financing on your Certified Pre-owned Volkswagen from Fredericton VW starting at 0.9%. 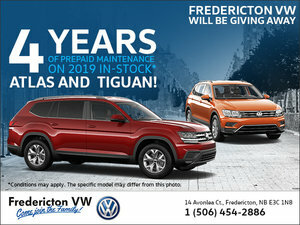 Fredericton Volkswagen's Out of Town Buyers Program is here to help. Anyone who purchases a used vehicle from more than 250 km away (one way) receives up to $250 based on hotel, airfare, ferries, gas, tolls. This incentive will be in form of additional discounts on top of the negotiated deal. Subject to change without notice. See dealer for details. Receipts for expenses must be submitted. Fredericton Volkswagen is the number one destination for your next pre-owned vehicle!